Hello lovely readers! With the cold weather outside, nothing is better than a comfy, cozy sweater right? I love sweaters! 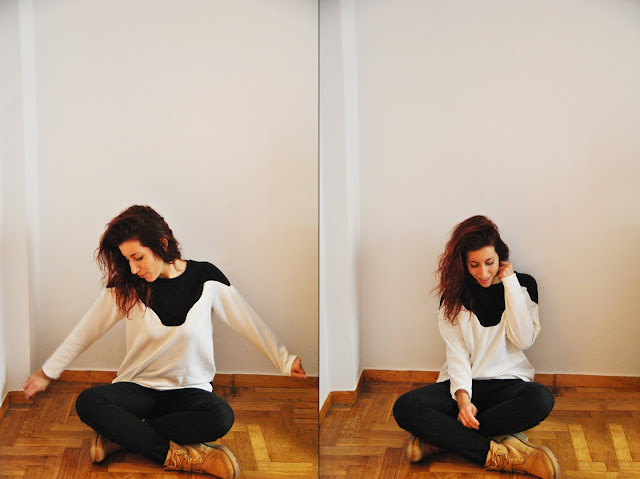 I love sweatshirts, knit sweaters, monochromatic ones, printed ones, basic ones! But things in the wardrobe can get a little repetitive with sweaters. Same boxy sweater in different colors (rings a bell?? right?). Enter the Zircon sweater/dress pattern from Paprika patterns. The pattern comes with two versions: View A is a sweater, resting above the hips, and View B is a dress of mid-thigh length. They both have really interesting yokes and hem insets. The pattern can be sewed in a variety of stable stretch fabrics such as sweatshirt fleece, french terry or neoprene. I chose to make View A (sweater) in size 4, without any alterations, in a sweatshirt fleece. I opted for the classic black & white color combination. The pattern is beautifully drafted, and the instruction are really clear! This turned out so comfy! To be honest, it takes a little time to sew and I recommend sewing this with a clear mind! All the different yokes and pointy ends, require a little patience, and as you can see mine turned out a little more rounded at the corners than they were supposed to be. But the outcome is really rewarding! I totally recommend checking out the Zircon sweater/ dress pattern if you want a twist on the classic sweater or a dress with beautiful details. Lisa's work is always exceptional!